One of the first steps when characterizing any sample of magnetic nanoparticles as a heating agent is to determine its capacity of absorbing power from the applied magnetic field. The parameter that measures this property is the Specific Power Absorption. Magnetic heating refers to the process of increasing the temperature of a magnetic material by the application of an alternate magnetic field (AMF). Many areas of nanotechnology include the phenomenon of magnetic heating of magnetic colloids through magnetic fields. The term “magnetic colloid” refers to a magnetic fluid made of ferromagnetic nanoparticles suspended in a non-magnetic carrier liquid. This heating is produced by the transformation of the energy absorbed by the ferromagnetic nanoparticles into heat, when submitted to an alternate magnetic field of certain amplitude and frequencies, a process defined as Magnetic nanoHeating (MnH). One way of characterizing the heating capability of the colloid is by means of the specific power absorption (SPA) or the intrinsic loss (ILP) values. SPA is defined as the amount of energy/power absorbed by the sample per mass unit (W/kg). where P is the absorbed power (in W) and mnp is the mass of nanoparticles in the sample (in kg). where Q is the heat (in Joules) generated by the MNPs within a time Dt (in seconds) by a mass mnp (in kg) of magnetic nanoparticles. This is an intensive property of the material. where mnp and ml are the mass of nanoparticles and the liquid carrier respectively, and cnp and cl are their specific heat capacities (in J/(K·kg)) which are intrinsic characteristics for each material. Temperature increase with time is calculated by the temperature data obtained during the test. 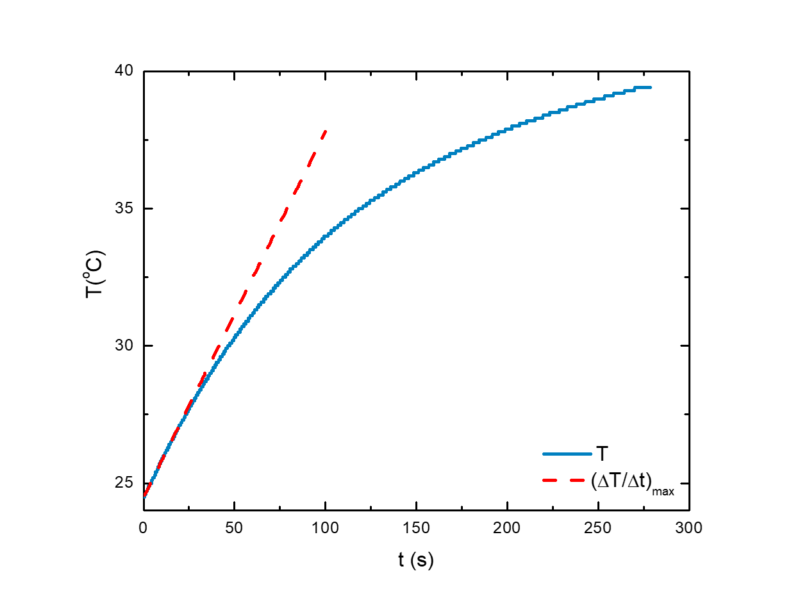 The value of increase in temperature with respect to time which is taken to calculate the SPA is the maximum value of the gradient of the temperature curve, which, in a test of Magnetic nanoHeating rate normally corresponds to its initial gradient (see Figure 1). Figure 1. 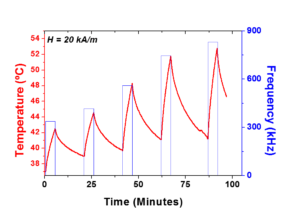 Temperature Rate Curve of a magnetic colloid submitted to a Magnetic nanoHeating (MnH) test. where the (δT/δt) is the maximum heating rate of the colloid submitted to an MnH test [K/s]. This equation can be further simplified assuming mnp·cnp << ml·cl and defining de sample concentration as j=mnp/Vl where Vl is the volume (in L) of colloid having a mass of nanoparticles mnp (in kg). this parameter (in nH·m2/kg) allows a direct comparison of datafrom different laboratories or with different devices. Kallumadil, M.; Tada, M.; Nakagawa, T.; Abe, M.; Southern, P.; Pankhurst, Q. A., Suitability of commercial colloids for magnetic hyperthermia. Journal of Magnetism and Magnetic Materials 2009, 321 (10), 1509-1513. YOU MIGHT ALSO FIND INTERESTING THIS RELATED POST! Many experimental research procedures involve one or more series of similar tests in which one parameter is swept, while all other parameters are kept constant. These procedures demand a rigorous execution of several steps in order to maintain the assumed experimental conditions. With that in mind, nB’s team equipped software Maniac with the experiment mode.